The Birthplace of B.C. 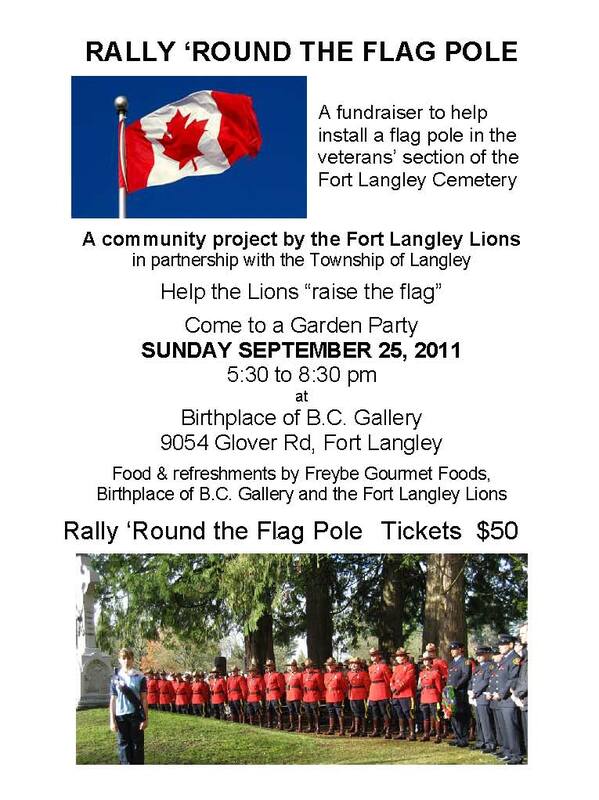 Gallery has partnered with the Fort Langley Lions to help raise funds for the installation of a flag pole in the veterans’ section of the Fort Langley Cemetery. The goal is to have the flag pole project complete in time for this year’s Remembrance Day Service (Nov 11, 2011) at the cenotaph in the cemetery located across Glover Road from the Gallery. A garden party fundraiser is being held at the Gallery on Sunday September 25, 2011. Call Brenda for tickets at 604 882-1191. Gallery | This entry was posted in Community Volunteers Make a Difference, Fort Langley Village News, Heritage Matters, Remembrance Day. Bookmark the permalink.